2. In a mixing bowl combine flour, salt and pepper. In another bowl combine eggs and water, whisk until smooth. In a third bowl mix together the bread crumbs, Parmesan cheese and basil. 3. In a large skillet heat the oil over medium heat. Dredge the cube steaks through the flour, dip into egg mixture and coat with the bread crumb mixture. Place them in the skillet, fry until browned on each side. 4. Place cube steaks in a greased casserole dish and place in oven. Bake for 20 minutes. 5. Meanwhile, in a medium bowl stir together the tomato sauce, sugar, 1/2 teaspoon oregano and garlic powder. After cube steaks have baked for the 20 minutes spoon this sauce over each. 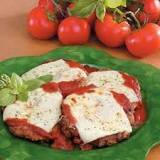 Top each steak with a slice of mozzarella and bake for another 5 minutes or until sauce is hot. 6. Serve with spaghetti noodles or mashed potatoes.